The 1902 Turnpike House is a restored farmhouse offering guests a refreshing retreat. Reminiscent of a bygone era, the 1902 inn is located the foot of Beech Mountain in the picturesque town of Banner Elk. Nestled in the mystery and beauty of the western North Carolina Highlands, the 1902 Turnpike House is just twenty minutes from Grandfather Mountain, and within minutes of Beech and Sugar Mountains. 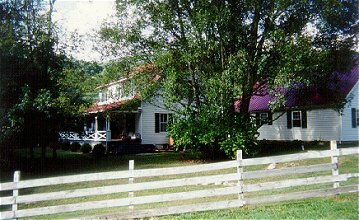 the Banner Elk area offers year round activities for visitors which include down hill skiing, white water rafting, trout and bass fishing, hiking, mountain biking, horseback riding, antiques, or just sitting on the front porch enjoying the cool summer breezes of the mountains. Many excellent restaurants are located within minutes of the inn. Families welcome!